This refreshing salad brings together light, summer flavours and is made complete with a dressing of wasabi, mayo, mint and lemon. 1. Place the prawns in a saucepan and lightly steam until they turn pink. 2. Remove from the heat and remove the shells. Set aside until needed. 3. 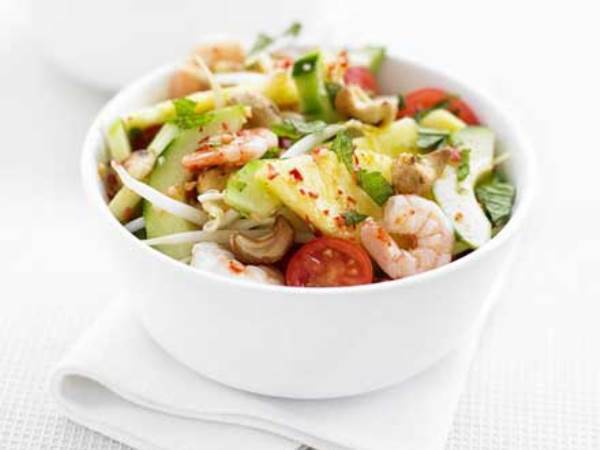 Layer the lettuce, rocket, spring onions and radishes on a platter, and top with the prawns, pineapple and cubed avocado. 4. Spoon over the dressing just before serving. 1. Whisk all of the ingredients for the dressing together. 2. Taste and adjust the seasoning and spoon over the salad just before serving.